“You shall therefore lay up these words of mine in your heart and in your soul, and you shall bind them as a sign on your hand, and they shall be as frontlets between your eyes. 19 You shall teach them to your children, talking of them when you are sitting in your house, and when you are walking by the way, and when you lie down, and when you rise. Therefore whoever relaxes one of the least of these commandments and teaches others to do the same will be called least in the kingdom of heaven, but whoever does them and teaches them will be called great in the kingdom of heaven. A disciple is not above his teacher, nor a servant above his master. nd know his will and approve what is excellent, because you are instructed from the law; 19 and if you are sure that you yourself are a guide to the blind, a light to those who are in darkness, 20 an instructor of the foolish, a teacher of children, having in the law the embodiment of knowledge and truth— 21 you then who teach others, do you not teach yourself? While you preach against stealing, do you steal? 22 You who say that one must not commit adultery, do you commit adultery? You who abhor idols, do you rob temples? 23 You who boast in the law dishonor God by breaking the law. And he gave the apostles, the prophets, the evangelists, the shepherds and teachers, 12 to equip the saints for the work of ministry, for building up the body of Christ, 13 until we all attain to the unity of the faith and of the knowledge of the Son of God, to mature manhood, to the measure of the stature of the fullness of Christ, 14 so that we may no longer be children, tossed to and fro by the waves and carried about by every wind of doctrine, by human cunning, by craftiness in deceitful schemes. Show yourself in all respects to be a model of good works, and in your teaching show integrity, dignity, 8 and sound speech that cannot be condemned, so that an opponent may be put to shame, having nothing evil to say about us. Not many of you should become teachers, my brothers, for you know that we who teach will be judged with greater strictness. 2 For we all stumble in many ways. And if anyone does not stumble in what he says, he is a perfect man, able also to bridle his whole body. Excellent post! 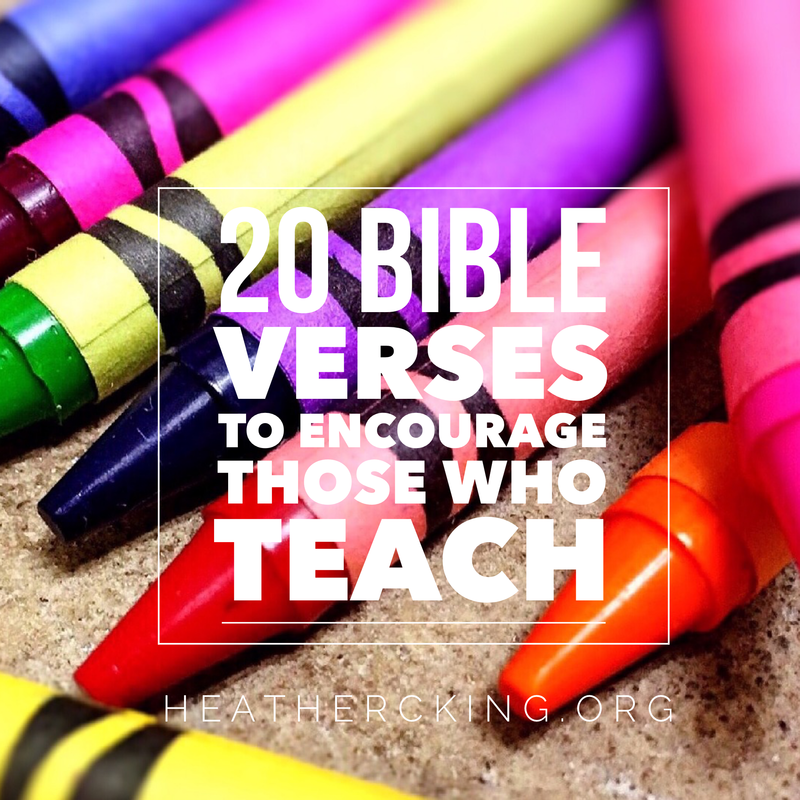 The Lord knows that teachers need heavy encouragement. Yes, definitely! We love our teachers; they give so much! I’m so glad they were a blessing!